In order to connect your computers wirelessly, all the gizmos on your wireless network must adhere to the 802.11 wireless networking standard. The standard has gone through released four (4) versions. Each version is indicated by a letter at the end of 802.11. From oldest to newest, they are a, b, g, and n.
Press the Win+Break key combination to open the System window or System Properties dialog box. In Windows 7 and Windows Vista, click the link on the left labeled Device Manager. In Windows Vista, you also need to type the administrator’s password or click the Continue button. In Windows XP, click the Hardware tab and then click the Device Manager button. 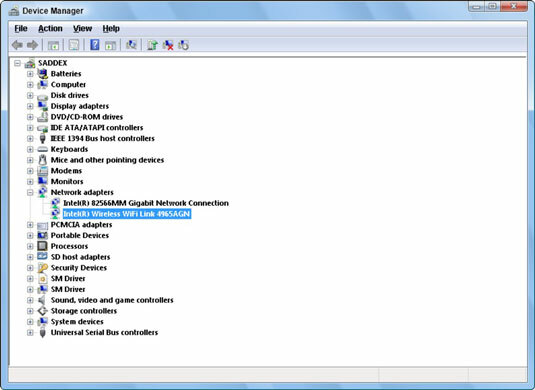 In the Device Manager window, expand the area labeled Network Adapters. You most likely see two network adapters. One entry represents the wired Ethernet adapter (NIC); the other, the wireless. Open the wireless networking adapter item. The adapter’s Properties dialog box appears. If you have an 802.11n-compatible adapter, you see a couple of entries for 802.11n settings. They confirm that the adapter is 802.11n-compatible, which means that it can also talk with older 802.11g as well as with 802.11b wireless networking hardware. Click the Cancel button to close the adapter’s Properties dialog box. Close the Device Manager window and any other windows you opened. All your wireless network devices should be of the same standard, especially if you want to get the most performance from the wireless network. Although you can mix up the lot, such as an 802.11n hub with 802.11g NICs, things still work — although you’re not getting all the 802.11n goodness from your 802.11g adapters. When you’re having trouble connecting an older PC or laptop to the wireless network, it’s probably using an older wireless standard. Replace it with a newer NIC. If any of your computers is using an 802.11b NIC, you would do well to replace it with an 802.11n model or get an 802.11n USB adapter. Yes, some letters are missing. I’m sure that there was an 802.11c standard, and who can forget that 802.11j standard? Although they probably had datasheets and prototypes, those standards were never released or made widely available to the public.